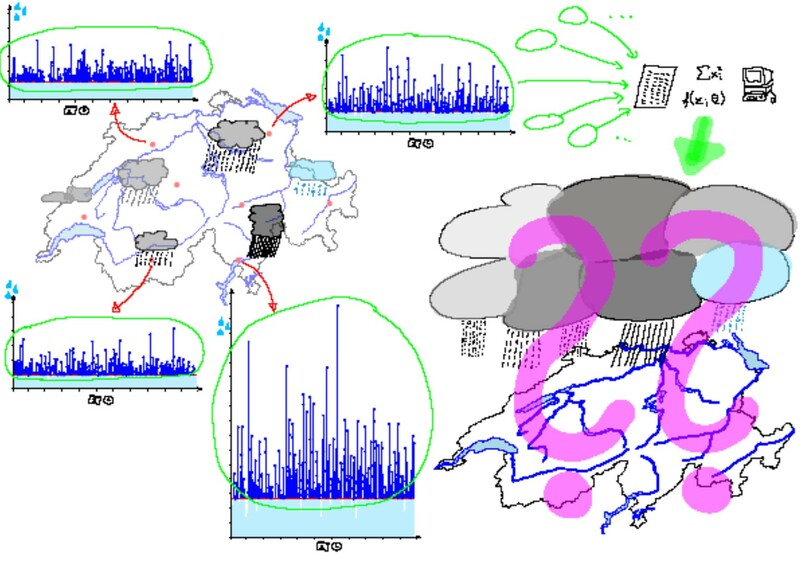 Since most floods are ultimately related by some form of extreme precipitation, where “extreme” refers to either the intensity or the duration of an event or to a combination of both, this project within the “flood research initiative” addresses extreme precipitation over Switzerland. More precisely, its focus lies on spatial dependence in extreme precipitation, which is particularly important in the context of floods because whether several catchments are simultaneously affected by a single heavy precipitation event or not has an impact on the resulting river discharges and thus on potential floods further downstream. In view of a better assessment of potential floods and their impact, the goal of this project is to simulate synthetic, but realistic and spatially coherent precipitation events under numerous scenarios and with known probability of occurrence. The resulting simulations should serve as input for subsequent modelling steps in hydrology and hydrodynamics. The known probability of occurrence for the precipitation events should allow to assign a return period to the extent and impact of the associated flood, as is common practice in insurance industry. In hydrology precipitation simulations are usually generated by so-called weather generators, but they tend to perform relatively poorly in reproducing extreme events. We therefore resort to the well-founded statistical extreme value theory and the spatial statistical models that have emerged from it so far. Being quite recent, the field of spatial extreme value statistics is still under strong development. In particular, the most-explored model is not suitable for our purpose and models that should tackle our problem have been proposed only very recently. In addition, fitting any spatial extremes model to a realistic-sized data set is not straightforward in general, but even less if a rather complex dependence structure as exhibited by precipitation over a large region has to be incorporated.